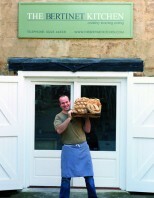 Basic ingredients: Specialist baking and much more from 2010 BBC Food Champion Richard Bertinet. The persuasive French chef and author leads a multi-talented team of tutors in the centre of Bath putting on one to five-day courses. Desperate Housewives and Hapless Husbands, Classic Bistro Cooking, Winter Entertaining, Croissant and Viennoiserie masterclasses are some of the courses available. There are also parent and children courses, as well as vegetarian and corporate options. Prices range from £145 to £500. They Say: We will teach you new tricks to take home and change the way you think about bread forever. We Say: A well-established, award-winning operation with bread at its soul. Check out the stylish cookshop and watch out for appearances from well-known chefs such as Valentine Warner and Valentina Harris.